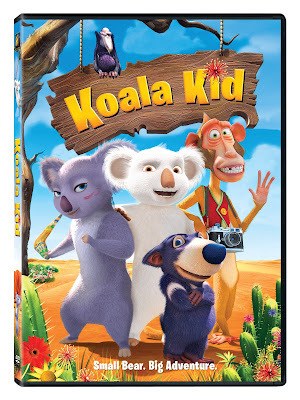 My kids were jumping with excitement when they saw the trailer for Koala Kid. From the trailer below it looks like it's going to be both kid and adult humor friendly which are movies I love, something for everyone to enjoy. In celebration of the release of Koala Kid we're sharing with you some interesting facts about Koala's, check them out! Koalas aren’t very social animals and spend just 15 minutes a day on socializing! From pregnancy, it only takes 30-35 days for a koala to give birth! When the joey is born he is a miniscule 0.5 g.
Koala Kid will be released on DVD on April 30, 2013!